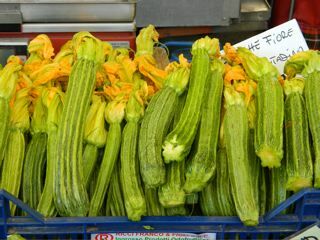 Italian zucchini like our Striato d’Italia (shown at right), Genovese, Albarello di Sarzanza, etc. have a more distinctive taste than American varieties. They tend to be big plants with lots of flowers. Use the flowers as well as the fruit. Winter squash like Padana and Marina di Chioggia have a sweet dry flesh and store well. They are excellent in soups, roasted, in gnocchi or with pasta. In our trials, they appear to have exhibited good resistance to downy mildew and powdery mildew. Culture. Squash like a loose fertile well drained soil. They really benefit from a few shovelfuls of compost or composted manure mixed in the planting hole. Direct seed a week or two after the last frost date when the soil has warmed up to 65-70 degrees. Plant 5-6 seeds ½-1 inch deep in a hill. (Actually a 10-12 inch circle. Space ‘hills’ three feet apart and rows five-six feet apart. Thin to 2-3 plants per hill. You can also use transplants for earlier crops if you are careful not to disturb the roots when you set out. Two to three weeks before set out date, sow 4-5 seeds in a six or eight inch pot. Thin to two or three. Carefully transplant into a hole taking care not to disturb the roots. Zucchini are ready in 50 or so days from direct seed, 10 days or so less from transplants. Zucchini will bear prolifically for 6-8 weeks, then production will fall off but continue. It is a good idea to make a second planting five or so weeks after the first and rip out the first planting when the second begins to bear. This will (1) continue production (2) take care of any plant loss from squash vine borers or squash bugs. For winter squash, plant 4-5 seeds in hills six feet apart in rows six feet apart. Insects & diseases. Cucumber beetles can seriously defoliate young plants. If they are present, control with lightweight remay cloth or rotenone or pyrethrum. Check the underside of leaves for egg masses and destroy them. For vine borers, cut the vine borers out and pile dirt around the wounded area. Rotenone around the base of the plant will also help to control vine borers. Harvest/storage/use. Harvest zucchini when small-four to six inches, although the eating quality of Italian squash remains quite good up to about twelve inches. Pick round zucchini when about the size of a baseball or softball. Pick Tonda di Nizza before they change color from light green to dark green. Make sure you pick plenty of flowers. They make excellent eating. Store in a refrigerator in the crisper. Cook the flowers in frittata, dip in egg & bread crumbs and fry or stuff. See the recipe list for more suggestions. Harvest winter squash when full grown and completely colored up by cutting the stem with a sharp knife leaving about an inch of stem. Harvest before the first heavy frost, although they will take a bit of a light frost without damage to fruit. Leave in the field a few days to cure. Store at 50-55 degrees with some air circulation. A cool basement will normally work as will an attached garage (if it doesn’t go much below freezing). Go through periodically and cull out squash which are showing some spoilage. Roast with carrots, potatoes, onions, rosemary, sage and some olive oil. Use in soups, gnocchi or cook with pasta.